Me chopping at lightening speed! We are back on the Meat wagon! Broke Lent in Dubai, what better way is there? if I tell you the first meat dish we had, you’ll just fall off your chair! But I’ll save all that for my Dubai post! Once I get my camera back from Shukie (my ubercool sister-in-law)…. So the long Labour day weekend called for hubby and I to pack up our bags and hit the road; we took Peggy Sue (our Toyota Camry) on her first road trip! Our plan was to drive down to Nakuru for a cousin’s (my hubby’s) ngurario, which is the last of a Kikuyu traditional wedding ceremony; then drive back down to Naivasha for the rest of the weekend. Somewhere in between there would be lots of cooking and golf! As usual, we didn’t leave on time, I was braiding my hair in Kiambu.. Don’t ask! So we set off to Nakuru rather late and arrived just in time for the after party. It was a fantastic night, lots of alcohol consumed, and apart from the hotel (Merica, I don’t recommend it to anyone) giving away our rooms, it was a night to remember, or not, depending on what you were drinking! Sunday evening, after sleeping off the hangover, we made our way down to Naivasha! We had friends over, and of course Z helped me in the kitchen.. She is, by the way, an amazing cook! 150ml red wine … Though you should really use red wine vinegar! We added a splash of balsamic for the vinegar part. We may have thrown in a few miscellaneous items in that I can’t recall, but like I always say, it’s all about what feels/tastes good to you! We mixed all the ingredients up in a sufuria (didn’t have a blender) and poured over the chickens, which were already cut up. Cover and leave in the fridge for at least an hour or overnight. To cook the bird, the best option would be to BBQ it over some hot coals, but it was about midnight by now so we chucked it in the oven! 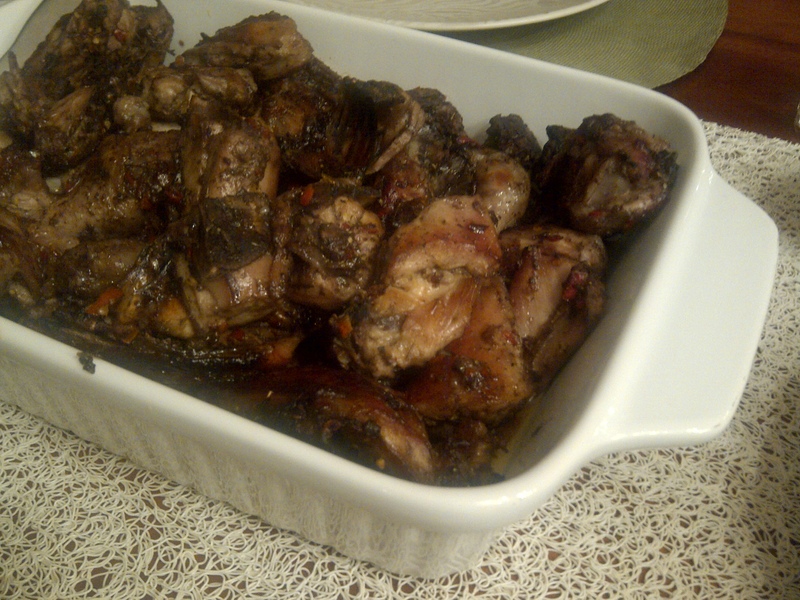 Cook for about 25minutes, or until the wine is finished and the chicken has blackened slightly..
We served the birds to 8 hungry people with Bhajias, kachumbari and some of the marinade sauce on the side. We had lots left over though, so hubby and I ate some the next morning for breakfast:) we’re that type of couple.. I must say a big thank you to my hubby, for taking me away on fantastic trips, and for happily eating my food and allowing me to eat my heart out everywhere we go!! Enjoy the chicken, and don’t forget to add MORE piri piri!!!! I put in a teaspoon, I didn’t want to interfere with the chillies! I was suprised that 15 chillies didn’t blow the top of my head off, but it was pretty mild! i think if your looking for more heat, then more chillies are needed. It all depends on what you can handle! now Ms. Lucille, the question is how much heat can you handle?? Can’t wait to read your Dubai post. 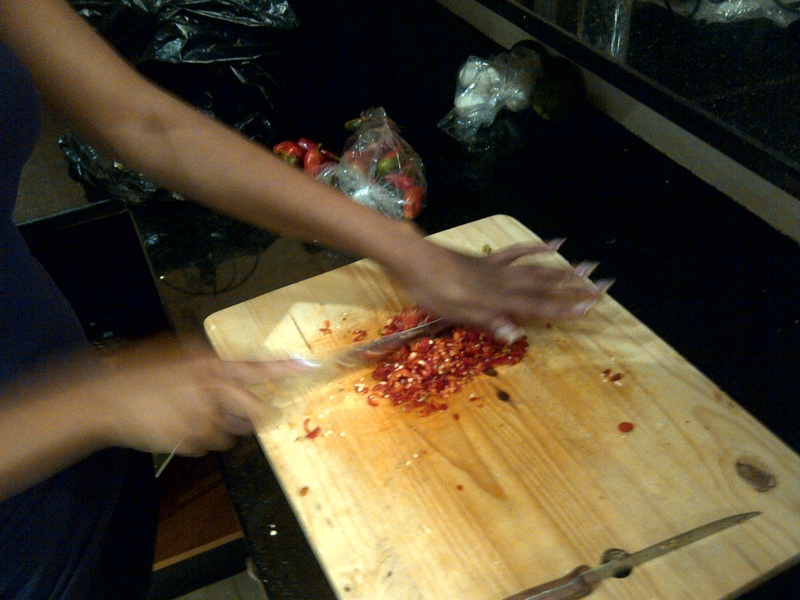 Love things with lots of chillies – you are brave to chop them like that. Your eyes must have been stinging like mad!